I would take the opportunity to thanks Valentin CARRUESCO aka Idleman for the timely patches he implemented within Leed. Of further interest is the vulnerability which affected the SES as it was due to a common mistake made when validating URLs. Let’s illustrate the issue with another occurrence of the same flaw, which affected LinkedIn and was reported back in November 2012. 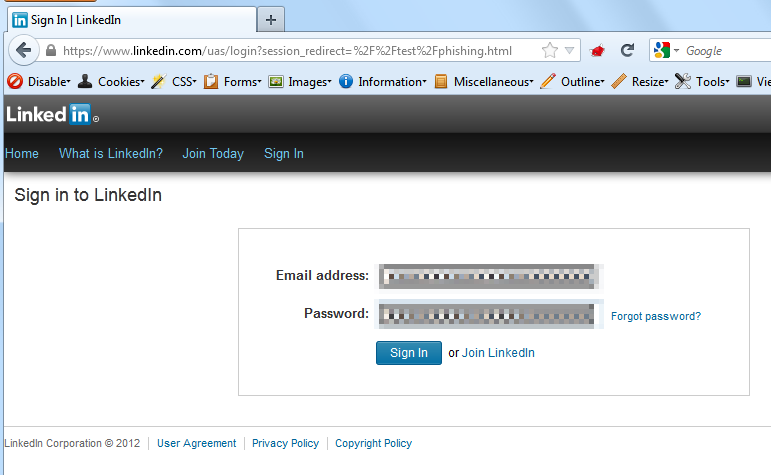 Attempts to misuse this mechanism and inject a full URL in parameter session_redirect (e.g. session_redirect=https:%2F%2Fwww.csnc.ch) would fail, presumably because the developers ensured that the first character of value session_redirect had to be a slash (or its URL-encoded hex value %2F). But what about partial URL //www.csnc.ch? Based on the aforementioned logic, such an URL would be considered as safe by the code, as it starts with a slash. But modern browsers don’t interpret a redirection to //www.csnc.ch as being http(s)://[victim]//www.csnc.ch, but in fact as a redirection to http(s)://www.csnc.ch. This behaviour is RFC conform and commonly used over the Internet to embed resources regardless of the URL scheme (http if the initial page was called over http, https if called over https). The issue was reported to LinkedIn in November 2012 and fixed without further acknowledgement. As a conclusion, do not assume that a partial URL value starting with a slash will always represent a path on your website. It may as well be a valid URL representation pointing to another domain. Furthermore, always perform redirections using a full qualified domain name and don’t just rely on a partial URL representation.